You’ve heard it before. The amount of people browsing the internet on a mobile device is growing every day. According to a recent article in the Washington Post “Mobile Internet use will continue to surge over the next five years, at a rate of 66 percent each year.” According to this same article mobile traffic will outgrow land-line data by three times within the next 5 years. What does this mean for you? It’s time to make sure your website is mobile friendly. By not having a mobile site, you could be missing a lot of opportunities for leads. Are you interested in seeing how many viewers are looking at your website on a mobile device? 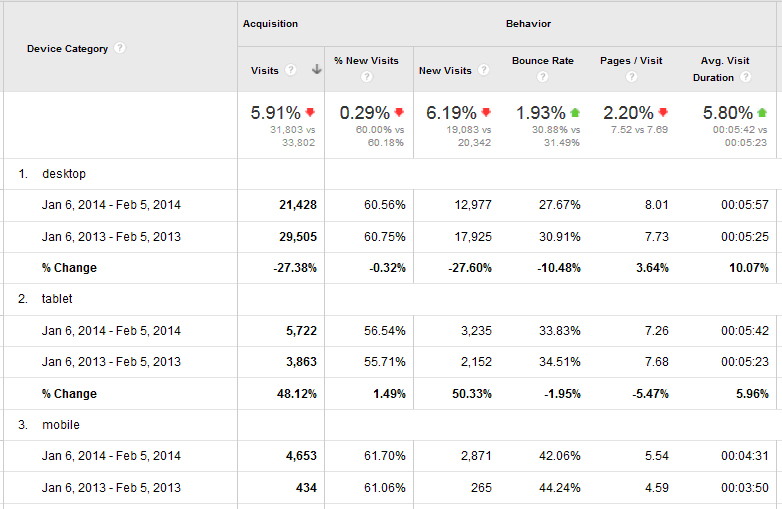 You can easily do this from your Google Analytics (or just ask your account rep, we can help you out!). On the left hand bar under “audience” there is a tab that says “mobile”. Here you can view the “overview” which breaks it down desktop, mobile and tablet, or you can view “by device” (iPad, iPhone, Kindle, etc). 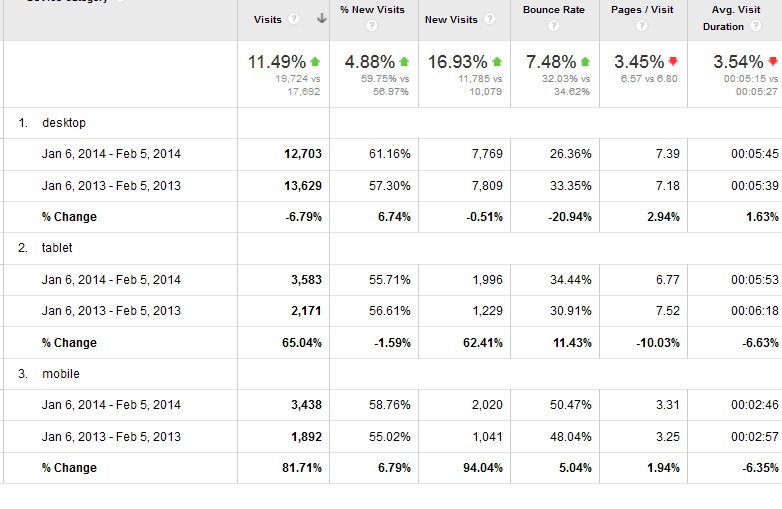 Below is a sample client’s traffic Jan 6 2014- Feb 5 2014 compared to Jan 6 2013-Feb 2013. This client has a responsive site. Notice in 2014, 21,428 of their viewers are on a desktop, and 10,375 of their viewers are on a tablet or mobile device. That’s 1/3 of their viewers! Now compare this to 2013 where 29,505 viewers were on a desktop, and only 4,297 viewers were on a mobile device or tablet. What a jump! 6,000 more mobile viewers in one year’s time. People are also visiting over 5 pages per visit, even on a phone! Now see sample client #2. Sample client #2 is in the same type of industry as sample client #1. Below is their traffic from Jan 6 2014- Feb 5 2014 compared to Jan 6 2013- Feb 5 2013. Their bounce rate is over 30% higher on a mobile site (in 2014) than on a desktop site. Their mobile and tablet users have significantly increased from 2013. This is the standard we see across most sites. We expect to see an even higher percentage of mobile and tablet users in 2015. Non-responsive/Mobile Friendly sites can be very frustrating to users on mobile phones. You can learn more about responsive websites on our site, or by contacting your account rep today!